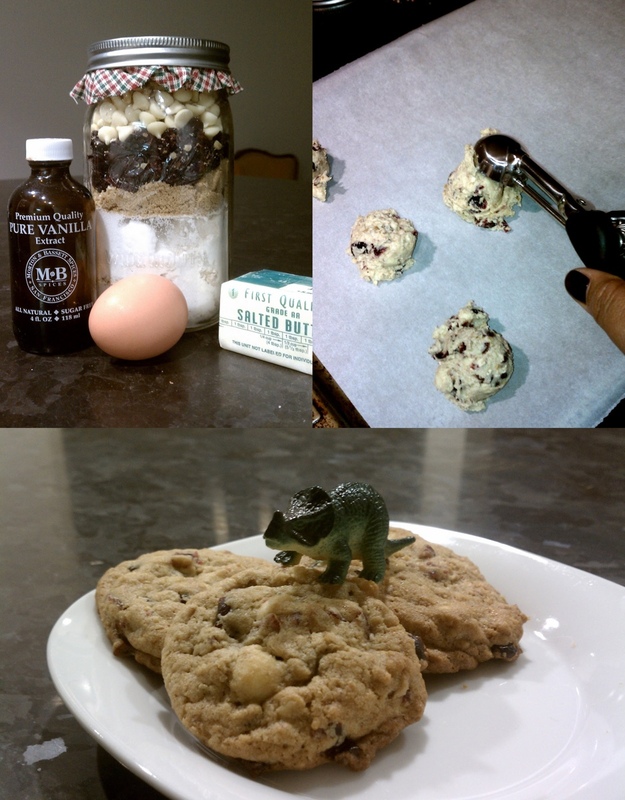 This was the 1st "Cookie in a Jar" I've ever made! I was super excited to try it when Kristina gave it to me for Christmas and I finally made them tonight. All I needed to add was a stick of butter, 1 egg and 1 teaspoon of vanilla then bake at 350 degrees for about 10-12 minutes. ManOhMan are these tasty! Even Steve the Stegosaurus thought so. Since I've been taking most of my photos with my camera phone, I've been playing around with some of the different camera apps I've downloaded. "Paper Camera" is my latest obsession. It has 12 different "lenses" to choose from. The one I used below is "contours". Silly but fun. In that last image, you might even be able to see that Steve the Stegosaurus has eaten enough cookies and is on his way home for a little nap. Love the paper camera snaps - the biscuits look amazing. I don't know why you allow Steve the Steg near your kitchen, he just can't be trusted when there are fresh Cranberry Hootycreeks in the vicinity.